This is one of the least photographed Futuros and the photo below is the first one I have seen in a long time. It was posted to Instagram by lvikman on 082617. The photo is the first I recall taken from the water. In addition to pinpointing the location of this Futuro Achim Breiling also came across a photoblog at fotodagboken.nu that includes some photos of the Futuro from 050505. I have not been able to find any contact information on the site; the url includes "carlsson" so maybe the gallery belongs to the Carlsson family? In any case if you know how I could get in touch with the owners of these photographs please let me know so I can check if it is OK to display them here. 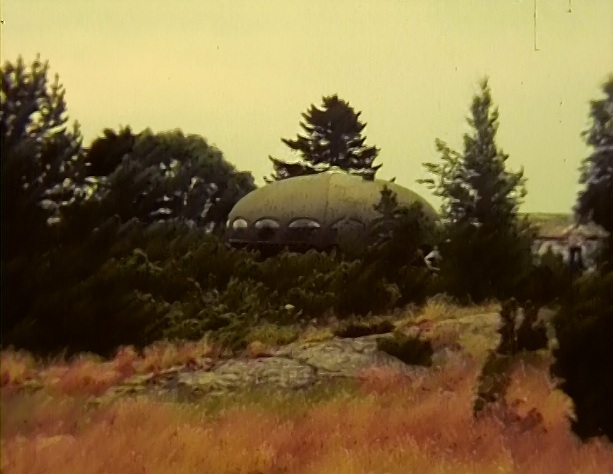 The featured image above and the two images below are screen captures from the video short "Hideaway In Archipelago" which was filmed in July 1997 by Mika Taanila. 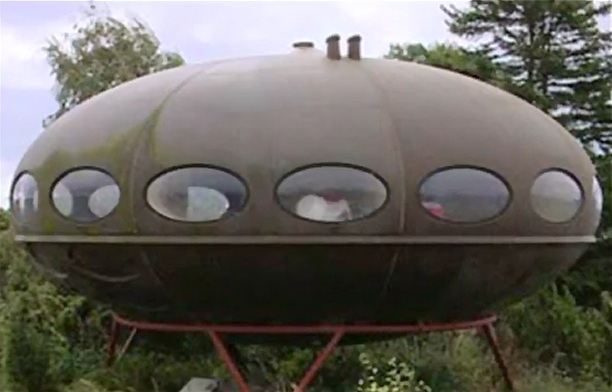 This video is one of the "DVD Extras" you get with the DVD of Mika Taanila's 1998 film "Futuro: A New Stance for Tomorrow" that is included with the Marko Home/Mika Taanila edited 2003 book Futuro: Tomorrow's House from Yesterday . These images are of a deliberately low quality and are screen captures from my own copy of the DVD. 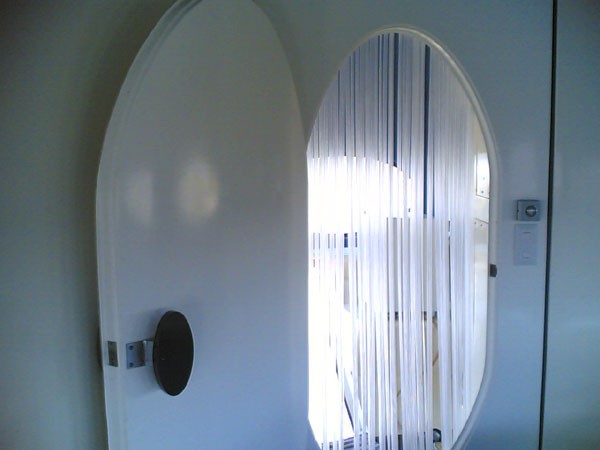 My intention is to give an idea the appearance of the Aland Futuro and not to provide copyright infringing images to be copied and reproduced elsewhere so please respect the owners rights and if you would like to see the video or use images from it for your own purposes please purchase your own copy of "Futuro - Tomorrow's House From Yesterday " Thanks. The two images below are captured from this video on Youtube. The video is actually just a series of photographs played in sequence none of which are attributed. 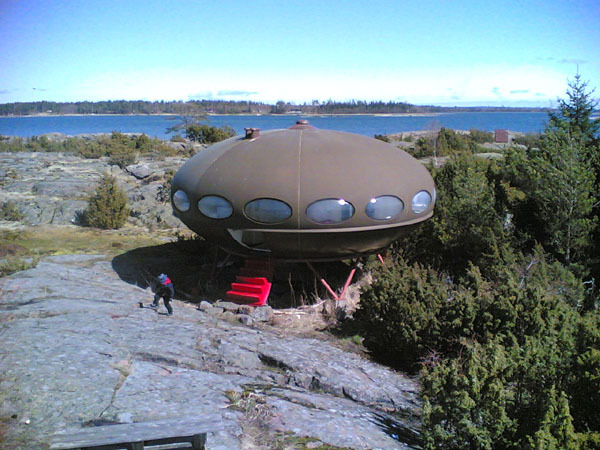 When researching the Aland Futuro I subsequently saw these same images in an article on the website Swedish YLE. I am unsure of the origin of the images so if you know or if your are the owner please let me know so I can provide correct attribution here. 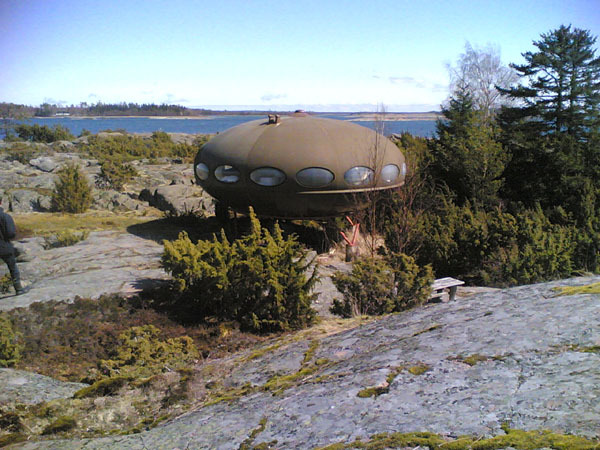 The video below features the Finnish band Fuerteventura and their track "Saucer " which was the second single from their debut album "Take Me To Your Leader ". 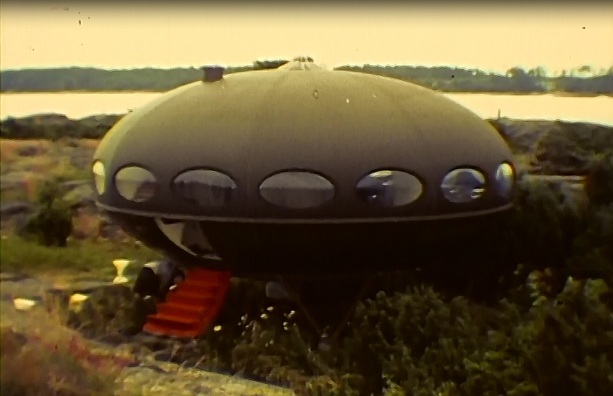 In the video the band is chased by an alien and they take refuge in a flying saucer - the Aland Futuro. I have now determined that I need glasses. I spent literally hours looking at Google Maps and Google Earth for this Futuro. Yesterday Achim Breiling emailed and told me he had found it. Lo and behold it is on an island that I must have looked at a dozen or more times; in fact I looked at every island in that area multiple times but I never noticed it. Admittedly the resolution is not great but even so I have no idea how I missed it. Anyway my thanks to Achim for finding this one. 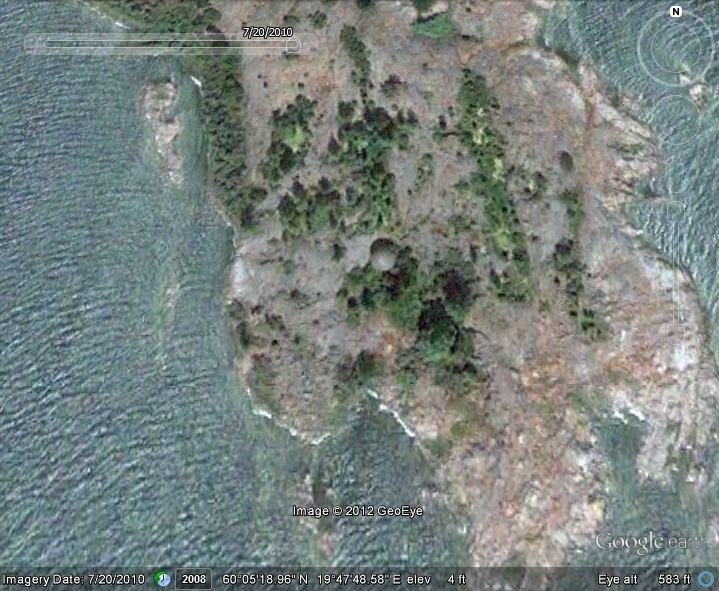 The Futuro is located on a small island called Storbroskär around 5 miles or so almost due West of Mariehamn at 60°05'19.31"N 19°47'49.08"E. The images below are taken from Google Earth and, despite the somewhat low resolution, in my opinion clearly show the Futuro at this location; the size is correct as is the color, the shadows cast also appear as they should do and the landscape around the unit matches [as best you can determine from the imagery] photos and videos of the Futuro's location. One other interesting thing to note; in the book "Futuro: Tomorrow's House from Yesterday " edited by Marko Home and Mika Taanila we are told that this Futuro was "painted brown to blend in with its surroundings" and the satellite imagery shows that was actually very effective [and perhaps that is my excuse for not spotting this when I looked at it many times]. At left are several photos from a photoblog to be found at fotodagboken.nu. 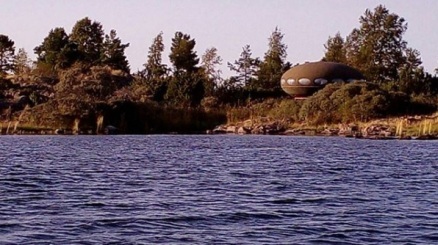 Though I am sure the translation is very inaccurate [Google does not do well with any of the Scandinavian languages] the brief comment that accompanies the photos translates to "I, Victor, Patrick and Saga were off with our boat to Patrick and Titti island Storbroskär and watched the saucer house." 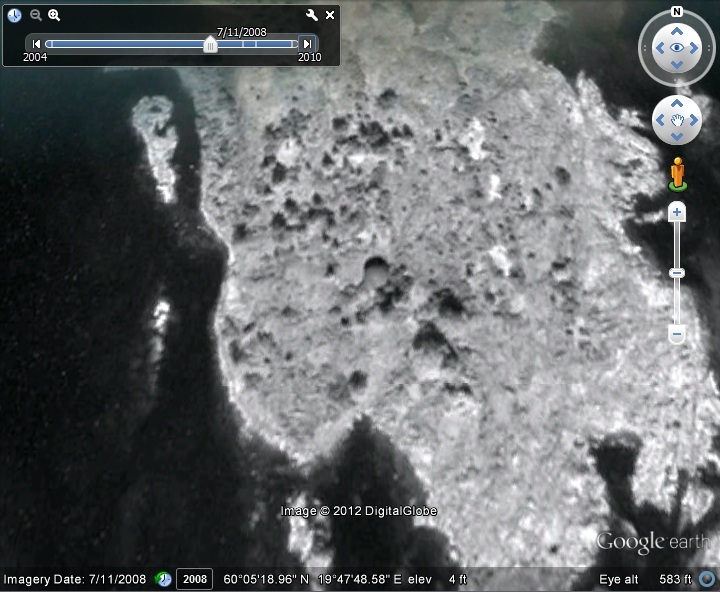 Even if the low res Google Earth imagery did not convince you I am sure that comment completely confirms Storbroskär as the correct location for the Futuro; not only is the name of the island mentioned but the comment also refers to "Patrick and Titti" who we know to be the owners of the Futuro. 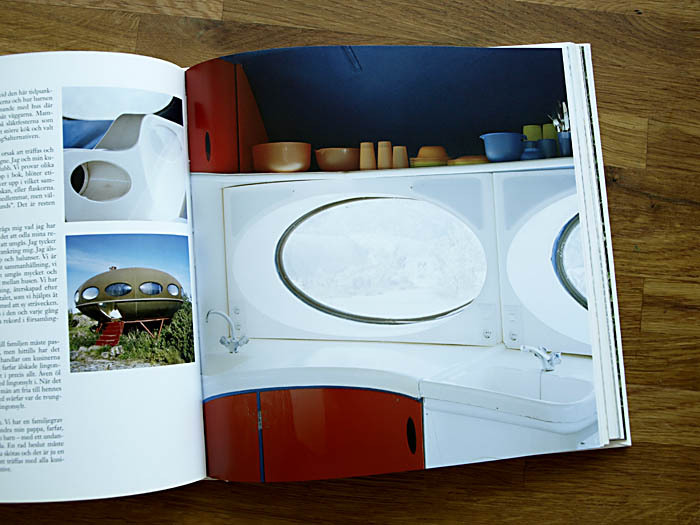 From the Marko Home/Mika Taanila edited 2003 book "Futuro: Tomorrow's House from Yesterday " and the included DVD we learn something of the Futuro House that sits in the Aland Islands. We are told that the Futuro, painted brown to blend in with its surroundings, is still the property of its original owner and that the Futuro is still used as a base for weekend fishing trips. The book was published in 2003 so we can confirm the Futuro as still on site at that time. An 111603 article on the website Swedish YLE [Swedish | Google Translate To English here] similarly confirms the Futuro on site in 2003. In this article we learn that the Futuro is now owned by Titti Sundblom and Patrik Westergård and that it was originally purchased by Titti's late father, Dan Sundblom. 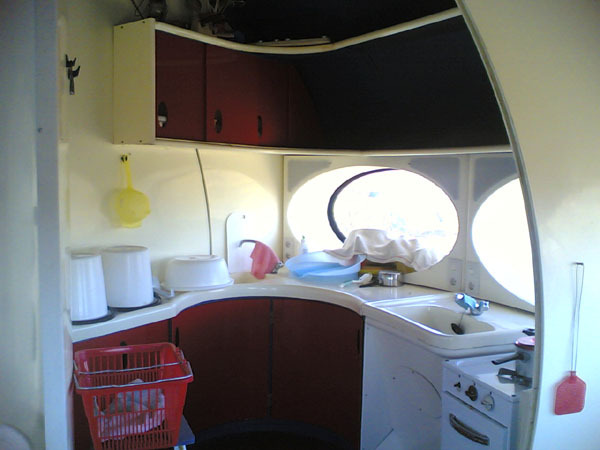 We also learn that the Futuro does not have power running to it and so it is used less often that it once was. 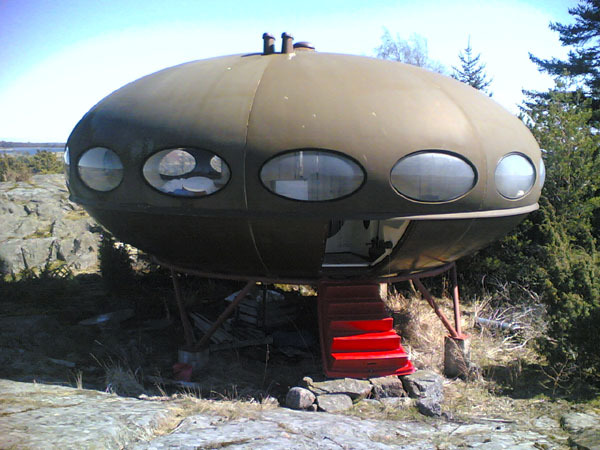 We are able to place the Futuro on site much later than 2003 by referring to Anna-Maija Kuitunen's final thesis for the Metropolia University of Applied Sciences in Finland. We learn that in an interview on 040610 the owner indicated that the Futuro had been on site since 1971 and that it remains in good condition with various repairs having been undertaken over the years to maintain its condition. The latest date I have been able to confirm the Aland Futuro as still being on site is 062211 and that is provided by an article published on the website HBL.FI [Swedish | Google Translate To English here] that was initially published 061607 but was updated subsequently updated on 062211. In this article we learn a little of Dan Sundblom's original reasons for purchasing the Futuro. His daughter and current owner Titti relates how for her father it was "about finding a house that you did not have to maintain because he was not a very practical person". 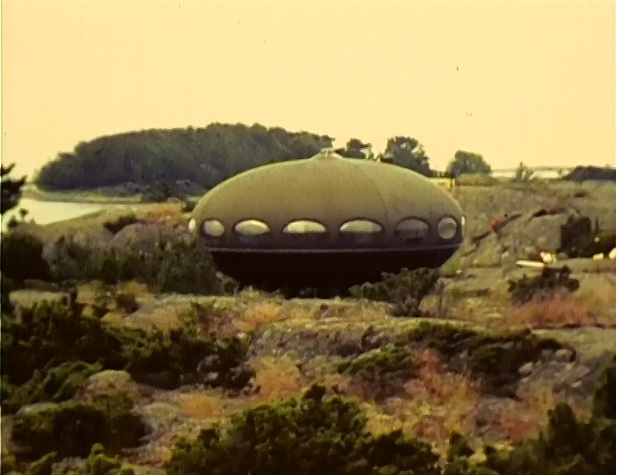 The Finnish band Fuerteventura produced a music video that featured the Futuro for their track "Saucer ", the second single from their debut album "Take Me To Your Leader ". 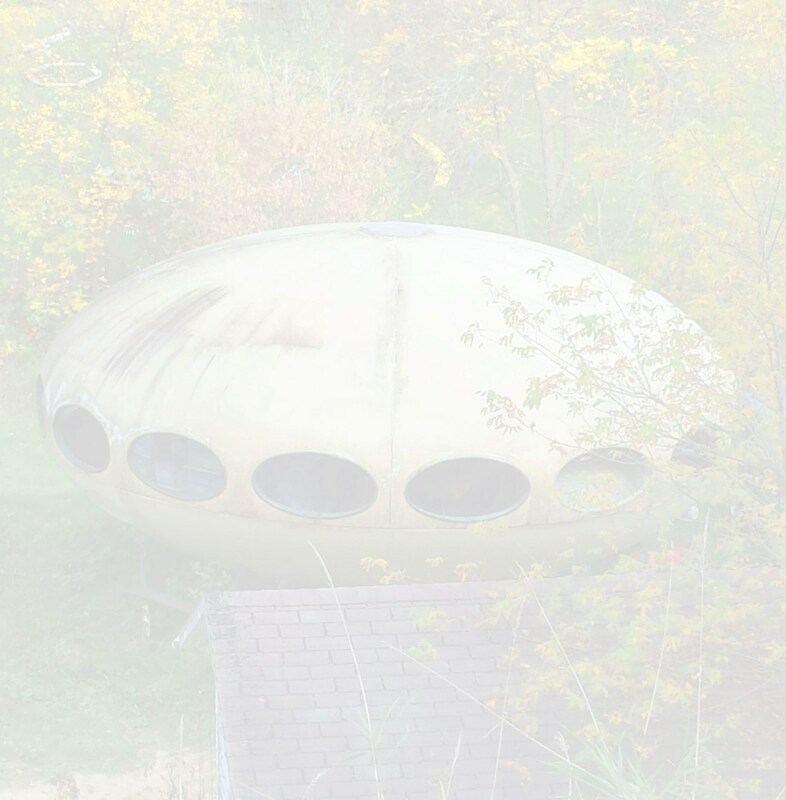 In the video the band is chased by an alien and they take refuge in a flying saucer - the Aland Futuro. You can check out the video at left. The Aland Islands Futuro has also made an appearance in print. 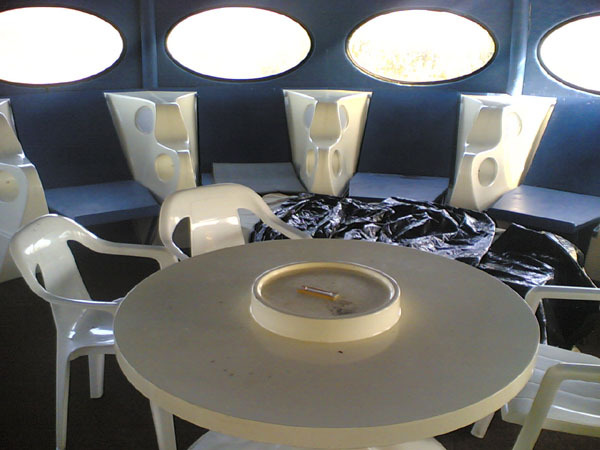 Britt-Marie Trensmar, in her book "Rötter och arv : tolv åländska hem" [ISBN10: 9515226619], discusses and illustrates homes and their interiors across the Aland Islands and the Futuro House is included. An 071111 blog post on the blog Divaani Blogit [Finnish | Google Translate To English here] provides a little more information along with this photograph. I have not been able to find a copy of this book for sale on a site that I can actually read or on a site that ships to the United States so; if you know of a copy please let me know. I will pay up front with a little profit thrown in to anyone who is able to purchase a copy of this book and then ship it to me. I have not yet been able to establish the exact location of this Futuro. The Google Map above is centered on Mariehamn, Aland Islands. 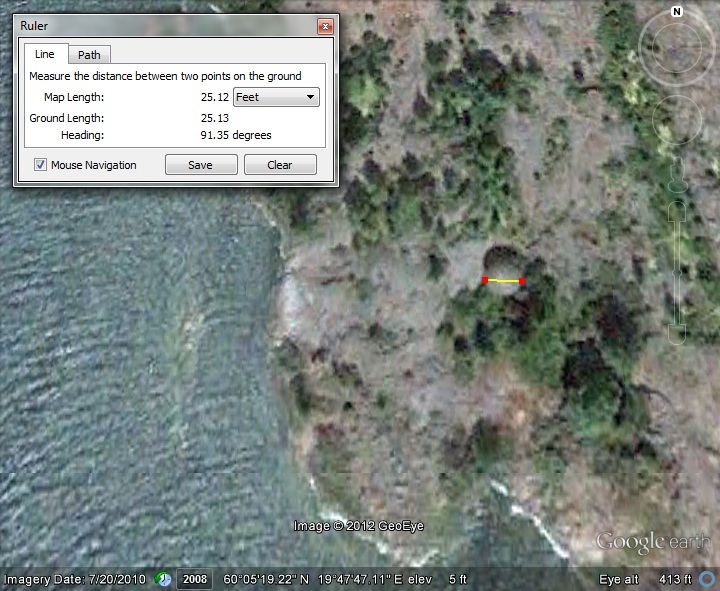 The various sources referenced above give clues as to the location [near Mariehamn, near Jomala, southwest of Mariehamn to name but a few] but to date pouring over Google Earth has not revealed its whereabouts. I will of course continue to search but should you know where it is located please let me know. Google Maps satelite imagery dated 101818.